Are Your Customer Experience KPIs Really “Key”? Do They Include the Impact of Employees? There was a recent line of discussion – “What is the optimal number of KPIs?” – in the CMO Network professional group on LinkedIn. The principal observation was that marketers put so many KPIs in place (and often confuse KPIs with metrics) that they become meaningless. So, there was a request for feedback from CMO Network members on what they felt was an optimum number. So, this certainly could not be identified as unanimity of perspective within the ranks. Going past the suggestion that KPIs and performance metrics are (or should be) somehow different, with disparate goals and objectives in application, the measure(s) question still remains an important one for any enterprise. 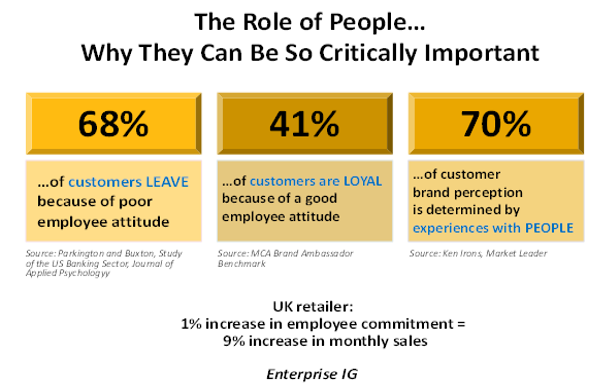 From a customer-centricity and customer experience management perspective, which is the loyalty “sweet spot” of organization and execution for any enterprise, I’d begin with a blog that Bob Thompson wrote almost a decade ago, “Find the ‘Ultimate’ Loyalty Metric to Grow Your Business”. At base, the blog was a discussion of the use, and many challenges, of NPS to identify drivers of business growth and a call a) to keep surveys succinct, b) to recognize that there are other business objectives of merit (such as improving gross margins, net operating cash flow, and shareholder return), and c) to remind researchers, through the introduction of NPS, that they needed needed to be more practical. Frankly, the evidence of experience in monitoring and working with many organizations has shown that relatively little of Bob’s great advice has been taken and applied. This is especially true where individual and team-based employee contribution to customer experience and customer behavior is concerned. With most companies still focused on measuring employee satisfaction, or happiness on the job, and engagement, which is principally about fit , productivity and alignment, their impact on customer loyalty and advocacy rarely comes into the KPI discussion. With that in mind, consideration of employee impact should be actively reflected in how overall enterprise performance is measured. There is a metric/KPI, or more appropriately a multi-question framework (not an index) that will help sustain and continue to improve it. 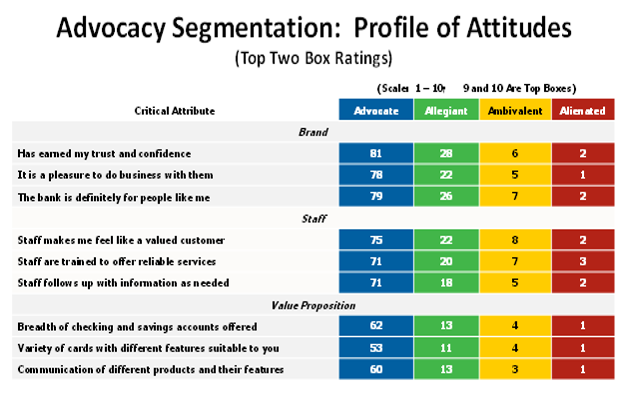 That framework is customer advocacy behavior: Advocacy is built on positive perception, active purchasing and a strong and supportive, vocal bond with a supplier, selected from all those that might be considered. A good portion of how customers behave toward, and bond with, a supplier has to do with employee commitment – to the company, to the product/service value proposition, and to the customers themselves. Employee commitment, which we define as ambassadorship, is a way of understanding customer effect that transcends both satisfaction and engagement. It directly influences customer advocacy. Note that, not atypically, employee contribution to positive customer emotional response to experiences and transactions is, along with brand perception, stronger than key components of the value proposition itself. In our consulting and research assignments, we consistently see results such as these. Here’s the bottom line: There’s nothing more powerful than linking causation with proof. That proof includes both employee-related and brand-related components. Extensive research in businesses around the world has demonstrated that a KPI, or metric, can be expressed as a single measure (as NPS originally postulated) — with the important proviso that it was drawn from an aggregated, relevant, and actionable (on a granular level) set of customer experience and behavior elements and drivers, not just a single, and questionable, question.